Create a powerful wireless N network with corner-to-corner signal coverage and get your favorite Wi-Fi devices connected with network speeds of up to 300 Mbps. Extend your existing wireless N network with the Zyxel WAP3205 v3 Wireless N300 Access Point featuring detachable high-gain antennas that provide stronger wireless coverage throughout your home. 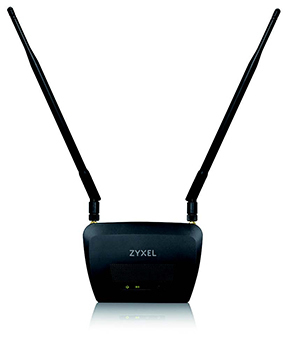 Extend your Wi-Fi coverage further with Zyxel WAP3205 v3’s high-gain antennas as they provide stronger signals for all your Wi-Fi devices to enable reliable connections and better coverage. The compact design enables you to place the Zyxel WAP3205 v3 Wireless N300 Access Point anywhere in any indoor environment without taking up too much space. If you wish to install the access point on a wall, screw holes are provided as well. Zyxel’s WAP3205 v3 Wireless N300 Access Point can be scheduled to turn its wireless off during unused hours to save additional power. Adjustable wireless output power enables you set how much power your Wi-Fi draws, and this can potentially save you even more power. Download the Zyxel WAP-3205 v3 Datasheet (PDF).